So let's say you're looking for the lightest of light summer fragrances, just a little bit of something so you don't have to go entirely scent-free on the hottest and most humid of days, but you're tired of citrusy Eau de Colognes. 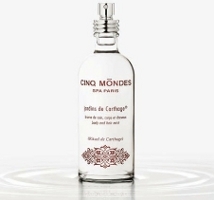 You could do worse than to investigate the fragrance mists from French spa line Cinq Mondes. The first in the series was Eau Egyptienne, a sheerest-of-sheer (but long lasting) spicy floral incense by perfumer Olivia Giacobetti that's been on my "buy" list for nearly forever. At one time, it seemed to be something of a cult favorite, but I don't hear it mentioned very often these days. They followed Eau Egyptienne with a collection of five aromatherapy fragrances called Pluie d’Arômes — these were formulated more like traditional Eau de Toilettes (and they cost more than the Eau Egyptienne). Now they've added Jardins de Carthage, developed by perfumer Marie Salamagne and inspired "by the perfumes of the legendary founder of Carthage, Queen Elissa...[who] surrounded her palace with lush gardens". Like Eau Egyptienne, it's meant to be sprayed lavishly, not dabbed on pulse points, and you can use it as a body, hair or linen mist; if you're after any kind of sillage at all, you'll want to spray it on your skin, your hair and your clothes. You can also keep it in the refrigerator for a cooling effect. The opening is a spiced citrus, quite peppery and lively; the heart is a pale and sheer (but still spicy) floral blend dominated by a soft rose. The base is woods, reportedly oud and cedar, and while it's still more transparent than not, the oud gives it a bit of depth. As advertised, it's refreshing and relaxing, and like Eau Egyptienne, makes a nice change for those days when you're just not in the mood for a "real" perfume. The lasting power is reasonable for a body mist, especially on clothing where it lasts for a good part of the day. And despite the queenly inspiration, it's perfectly unisex. Cinq Mondes Jardins de Carthage is available in 100 ml, $65. They eventually released Eau Egyptienne in a 15 ml size ($25), and I hope they do the same with this one: it would be a nice thing to keep in your purse. The notes include nutmeg, bergamot, pink pepper, rose, jasmine, oud and cedar. For buying information, see the listing for Cinq Mondes under Perfume Houses. You just reminded me I have the 15ml Eau Egyptienne, now my SOTD! It’s a great scent, really…hope it is still selling. This sounds lovely. Though, I may rather try Eau Egyptienne. I would love to have both in 15 ml, but do like the Eau Egyptienne a tad better. Both really nicely done though. Would be nice if they’d do some of the Pluie d’Arome scents in mist too, I really liked some of those but thought $85 for 50 ml was a tad steep for what they are. Between the notes, the concentration and Queen Elissa I am sorely tempted to order this unsniffed. Gosh, never buy unsniffed, right? At least wait until they’ve done a 15 ml. Eau Egyptienne is still my go-to hot weather scent. I’m actually on my second full bottle of it. This one sounds nice, too! I wish the 15 ml of EE had a real cap, though. Unless they’ve changed it recently it’s not going to work as a purse spray because the spray mechanism isn’t protected at all. Oh, good point! That’s a definite drawback for the purse, thanks. Thanks for the review, Robin. I definitely want to get a sniff of these! Never hurts to try! Eau Egyptienne would make a great pillow spray, not sure I’d want even a sheer oud on my linens, but will probably end up trying it. If anyone is waffling on one of the Pluie d’Arômes you can get a free 15 ml Eau Egyptienne with an 85 dollar Cinq Monde purchase. Ennabling financial excess since 1964. Thank you! That is tempting, very tempting. Oh, not bad! But not going to cave. Want both in 15 ml. And wish they’d do a coffret of all the Pluie d’Arome scents in 15 ml too. I thought they did …..for 65 euros…I’d have to go check the website but I thought I saw a set of 5 small bottles….but I have a lousy memory, so who knows. ahhhhh, Monkeytoe….we speak the same language! Sounds like an interesting Eau since we’re entering the Season of Eaux. I can’t add one more thing to the craving list though. And I’m covered for the time being because I received a bottle yesterday of SMN Acqua di Colonia (which I’m splitting most of). A great cologne thing, but all I could really think was, “but WHY would I ever buy a lot of this when like a PINT of 4711 costs $20 and it smells better?” Does that represent some kind of shift in perfumista thinking? And can you clarify: is this alcohol-based or water-based? I’m not sure exactly what “fragrance mist” means. The list of notes for this AND Egyptienne do sound very good. Not trying to focus on the negative, but I also need to say I also find Beautyhabit’s website not so user-friendly also. If I know what I’m looking for, search is great, but the way things are categorized into “lines” often makes it difficult to look at all products from a particular brand/house. Yeah. I don’t like that either. Actually, none of the niche websites are perfect: I want to see all the products on the first page for the brand, preferably with the choice of alphabetical order or sorted by newness. Was it me who sent you the squidge of 4711 last year? I love that stuff. It hasn’t been warm enough for it here yet. It *is* good. A friend brought some back from Germany when we were in high school, and I now have a huge jug in the refrigerator. I have the “huge jug” size too—just too good of a deal to pass up…now I don’t know what to do with it all! Tama: You may have sent me a squidge, but Daisy sent me a (no lie) spice jar full of about 50ml about a year or so ago too, so I’m well stocked. LOL –hey! that jar was sturdy glass and the lid sealed well—at the time, it was either that or ten little plastic atomizers… ohhh, you could have had one in every room of the house! easy access cologne! It’s alcohol based but very light, lighter than most EdTs -> you could use it like an Axe spray. Ok, does 4711 *really* smell as good as SMN AdC? That would not be my memory, but am open to being convinced. Don’t own either in any case. To be honest, I think 4711 smells “better” than the SMN… or at least that just means 4711 appeals to my nose more. I spritzed on the SMN and didn’t have anything like a moment of “OMG, this is the best Eau de Cologne I have ever smelt!” I put a goodly spritz on one arm, but I may change my mind when I do a more thorough testing (and heavier spritzing… which you know I love to do). BTW, I also got Melograno, and against all soapy-and-aldehydic odds, I’m finally sure that I love the stuff. Interesting. I remember really liking the SMN and thinking 4711 (last time I smelled it, a couple years ago) smelled not so nice as it used to. But memory is funny, I could be quite wrong! I am utterly immune to Melograno though. Robin — funny you should ask about 4711…I just smelled it yesterday for the first time in about forty years and it took me right back to my summer stock theatre job in high school. I was the personal wardobe dresser for one of the leading actors and as a small thank you, he gave me a bottle of 4711–my first perfume gift. I loved it then and I must say that I had to restrain my self from pulling out my credit card for a big honking bottle at only 29.99!!! I think that it still smells the same, but hey, even if a little different it is still a great scent for summer day. Interesting, thanks! Will have to smell it again. How does Acqua di Colonia last for you? I love the way it smells, however it simply does not last long enough for me to even want to wear it which is such a disappointment. I’ve noticed it does tend to last on clothing, though, so I may need to just start splashing it on my blouse and see how that lasts throughout the day. And isn’t Melograno glorious? Always pleased to hear others love it. If only all perfumers would get on board with the 15ml size! I wonder, actually, if that would increase or decrease sales overall? The other day, I was thinking to myself, Self, you would easily buy hundreds of dollars MORE in perfume every year if it was possible to buy smaller sized bottles. I wonder if this is true for everyone – would Bvlgari, for instance, double their sales revenue every year if they sold 15ml bottles of their juice? Or does most of their money come from people who have no problem paying $80+ for a bottle of perfume that they will never finish? Bvlgari does sell very small sizes…tons of 10 ml travel sprays at Sephora. Sephora clearly wants to sell small sizes, and they’ve got lots of travel sizes and/or roll ons from lots of brands. My take is that the department stores don’t want to sell them. At this point, the mainstream brands are doing way better than the niche brands on this point. Since I’ve been craving Eaux since the first day the temp hit 90 (gonna be a looong summer) the Eau Egyptienne sounds very appealing. Wonder how long a 15 ml lasts if sprayed liberally? Strange – I’ve had a sample of Eau Egyptienne in my drawer and finally tried it earlier this week. It’s very pretty! I like the sound of this one, too. I want a bottle of Sud too!